The R ecosystem knows a vast number of time series classes: ts, xts, zoo, tsibble, tibbletime or timeSeries. 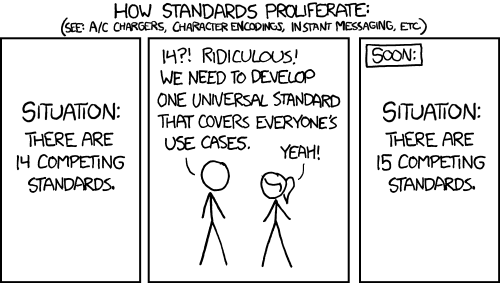 The plethora of standards causes confusion. As different packages rely on different classes, it is hard to use them in the same analysis. tsbox provides a set of tools that make it easy to switch between these classes. It also allows the user to treat time series as plain data frames, facilitating the use with tools that assume rectangular data. The tsbox package is built around a set of functions that convert time series of different classes to each other. They are frequency-agnostic, and allow the user to combine multiple non-standard and irregular frequencies. Because coercion works reliably, it is easy to write functions that work identically for all classes. So whether we want to smooth, scale, differentiate, chain-link, forecast, regularize or seasonally adjust a time series, we can use the same tsbox-command for any time series class. This blog gives a short overview of the changes introduced in 0.1. A detailed overview of the package functionality is given in the documentation page (or in a previous blog-post). Version 0.1, now on CRAN, brings a large number of bug fixes and improvements. A substantial change involves the treatment of NA values in data frames. Previously, all NAs in data frames were treated as implicit, and were only made explicit by a call to ts_regular. This lays the groundwork for ts_span to be extensible. With extend = TRUE, ts_span extends a regular series with NA values, up to the specified limits, similar to base window. Like all functions in tsbox, this is frequency-agnostic. For example, in the following, the monthly series mdeaths is extended by monthly NA values, while the quarterly series austres is extended by quarterly NA values. In rectangular data structures, i.e., in a data.frame, a data.table, or a tibble, tsbox stores one or multiple time series in the ‘long’ format. By default, tsbox detects a value, a time and zero, one or several id columns. Alternatively, the time column and the value column can be explicitly named time and value. If explicit names are used, the column order will be ignored. Finally, we fabricated a tsbox cheat sheet that summarizes most functionality. Print and enjoy working with time series. We are hiring a data scientist/engineer! You are enthusiastic about R and know a bit about Git – everything else is negotiable. We offer interesting projects around the R ecosystem and lots of freedom, with option to work remotely. Experience in Machine Learning, Statistics, Programming, Experience with Databases, Teaching, shiny, tidyverse, etc., is a plus. Please submit your application via mail@cynkra.com, or share a private GitHub repository with us. Get in touch with us if you have further questions. cynkra is a Zurich-based data consulting company with a strong focus on R. We use R and the tidyverse in the vast majority of our projects. We support businessess and organizations by helping them picking the right tools, implementing solutions, training and code review. We are enthusiastic about open source software and contribute to it, too. Learn more at www.cynkra.com. Time series of the world, unite! tsbox, now freshly on CRAN, provides a set of tools that are agnostic towards existing time series classes. It is built around a set of converters, which convert time series stored as ts, xts, data.frame, data.table, tibble, zoo, tsibble or timeSeries to each other. We jump form good old ts objects toxts, store our time series in various data frames and convert them to some highly specialized time series formats. ts_scale normalizes one or multiple series, by subtracting the mean and dividing by the standard deviation. It works like a ‘generic’ function: You can apply it on any time series object, and it will return an object of the same class as its input. 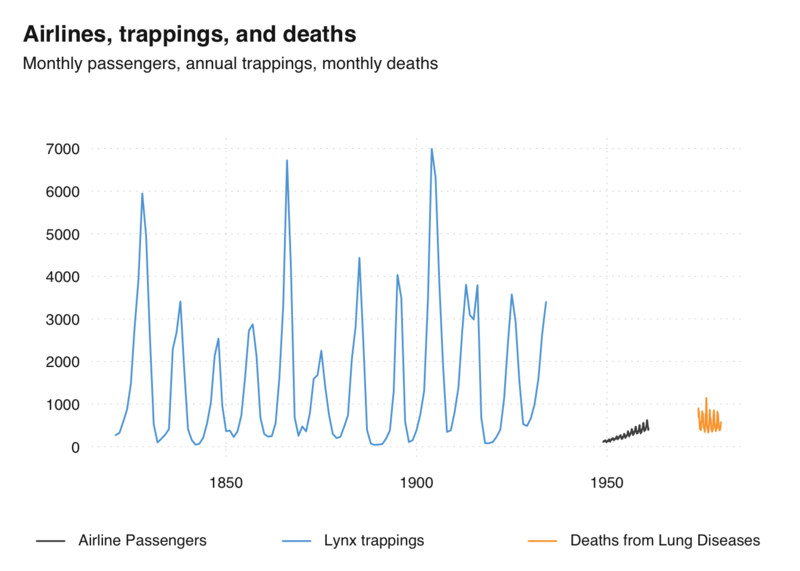 subtitle = "Monthly passengers, annual trappings, monthly deaths"
There is also a version that uses ggplot2 and has the same syntax. You may have wondered why we treated data frames as a time series class. The spread of dplyr and data.table has given data frames a boost and made them one of the most popular data structures in R. So, storing time series in a data frame is an obvious consequence. And even if you don’t intend to keep time series in data frames, this is still the format in which you import and export your data. tsbox makes it easy to switch from data frames to time series and back. Note that ts_ returns a function, which can be used with or without a name. In case you are wondering, tsbox uses data.table as a backend, and makes use of its incredibly efficient reshaping facilities, its joins and rolling joins. And thanks to anytime, tsbox will be able to recongnize almost any date format without manual intervention. So, enjoy some relieve in R’s time series class struggle. We at cynkra support your business and the people behind it by helping you pick the right tools, implementing and supporting solutions, training and code review.